Although the U.S. government has never officially defaulted on its debt, it missed payments on some Treasury Bills in 1979. Then as now, Congress was playing a game of chicken with Republicans and Democrats bumping heads on raising the debt ceiling. 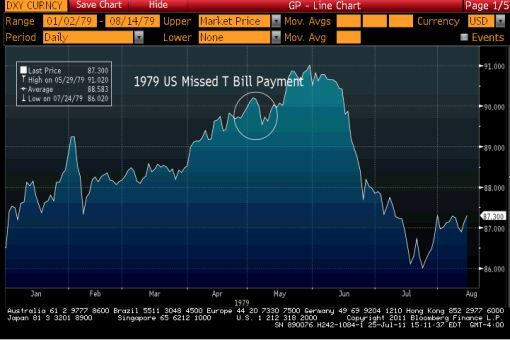 The debt limit was a fraction of its current levels and at the time, the dollar only fell briefly. The 0.6 percent drop in the Dollar Index was so small that it was barely left an imprint. However less than a month later, double digit inflation and concerns about the outlook for the U.S. economy along with the security of the U.S. dollar drove the greenback sharply lower. It may be tempting to attribute this decline to the short term default on U.S. debt but the Treasury started making its T-bill payments again after a very short delay.